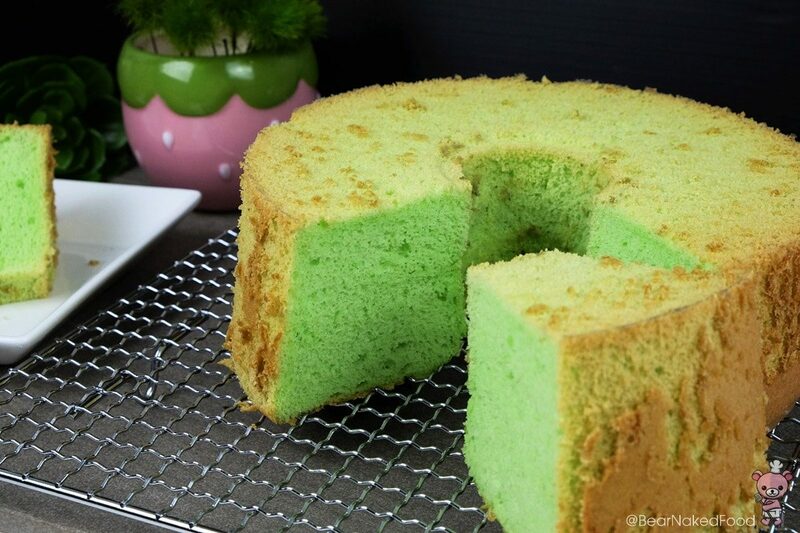 If you are from Southeast Asia, then this Pandan Chiffon Cake should be a sight for sore eyes. 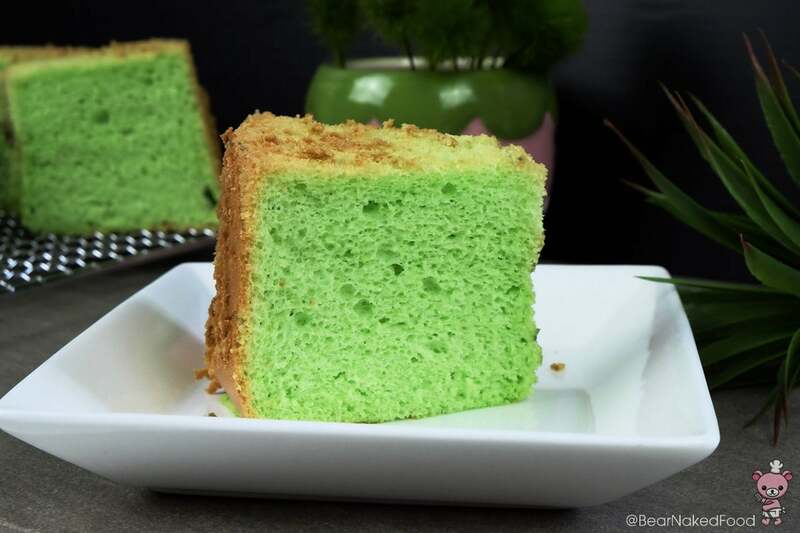 It wasn’t until recently that I discovered the origin of this light, fluffy sponge cake hails from Indonesia. 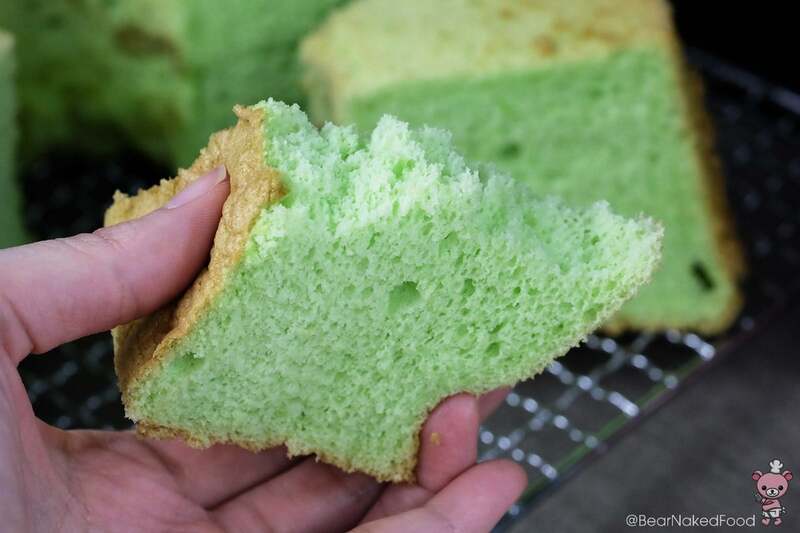 The signature green of this cake usually comes from the juice of pandan leaves aka screwpine leaves although green food coloring is also commonly used to enhance the color. 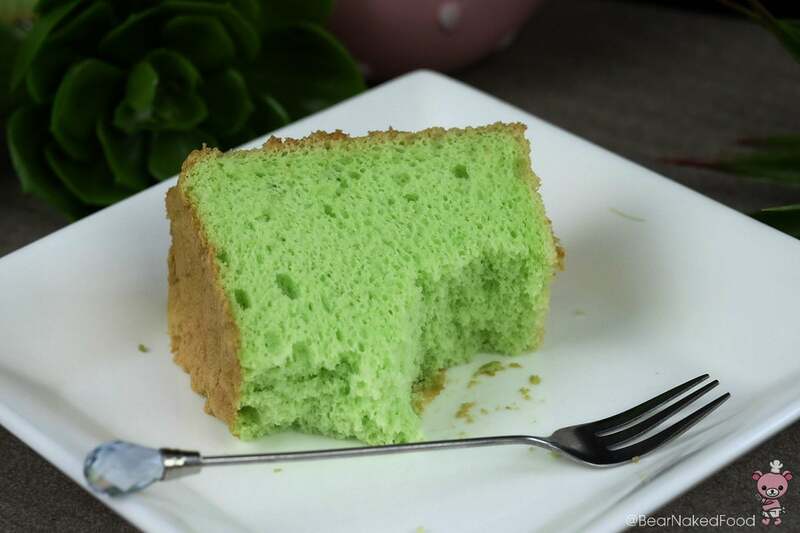 Just like how we would always lug back boxes of pineapple tarts from Taiwan or egg tarts from Hong Kong, tourists from our neighboring countries could be seen doing the same with boxes of pandan chiffon cakes at the airport. Along with packets of bak kwa (Chinese BBQ jerky). 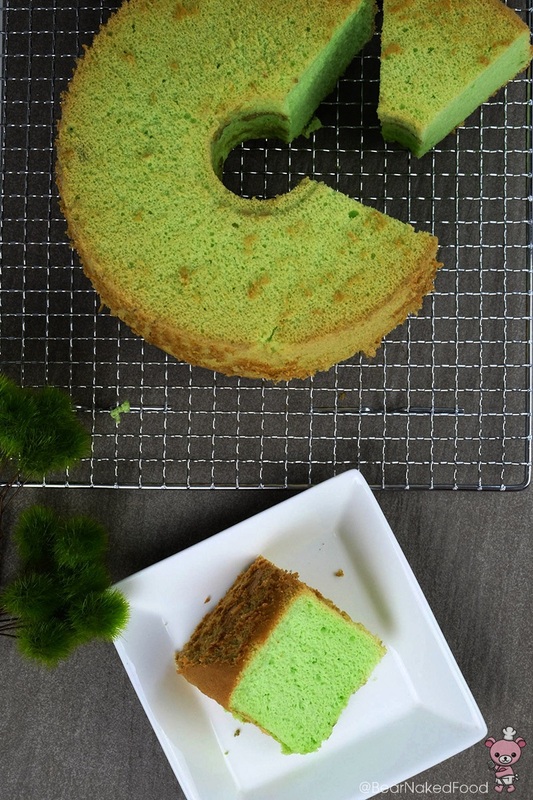 Anyhow, when Tiger brought some over to work for his Russian colleagues to try, they were so intrigued by the color and taste, they (the cake) were gone in 60 seconds. I’m not kidding! Or maybe they were really hungry. I chose to believe the former. 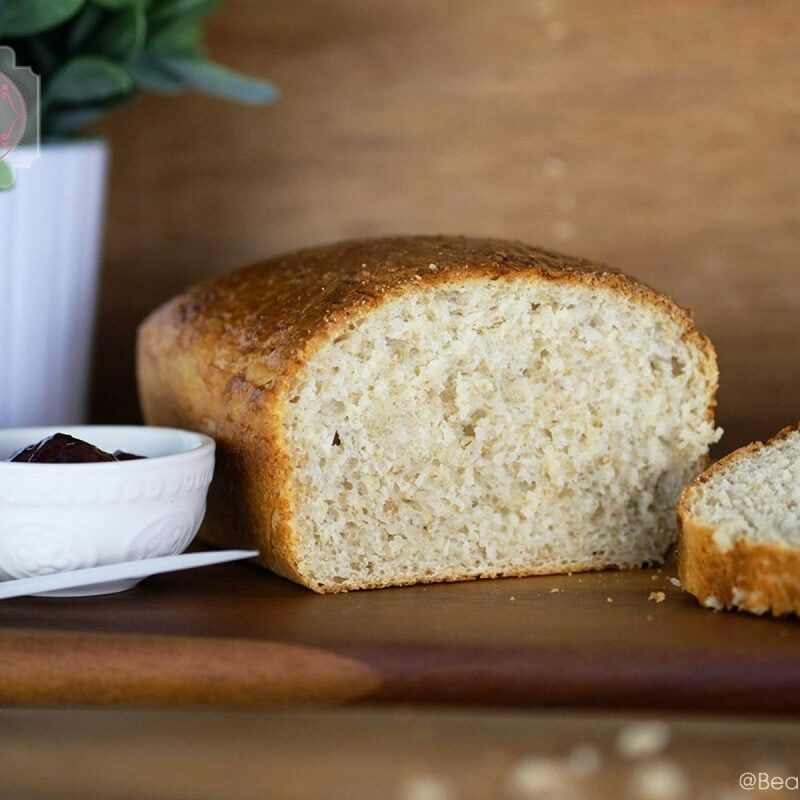 Having tried a few other recipes online, I found this by Dr. Leslie Tay to be the most successful. 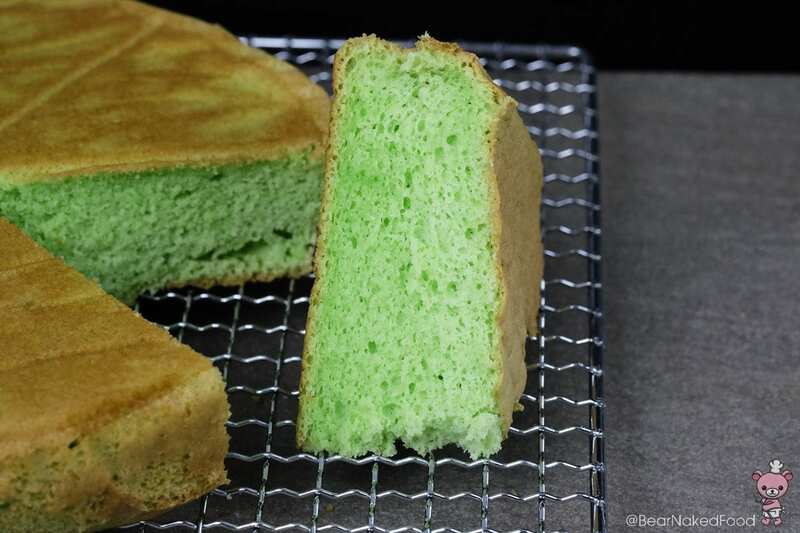 The recipe below is fit for a 25cm chiffon pan but since my chiffon pan is 23 cm, I baked the remaining batter in an 8 x 3 (20 cm x 7 cm) round tin. Absolutely no wastage, mom would be very proud of me. I was actually quite happy with the result. 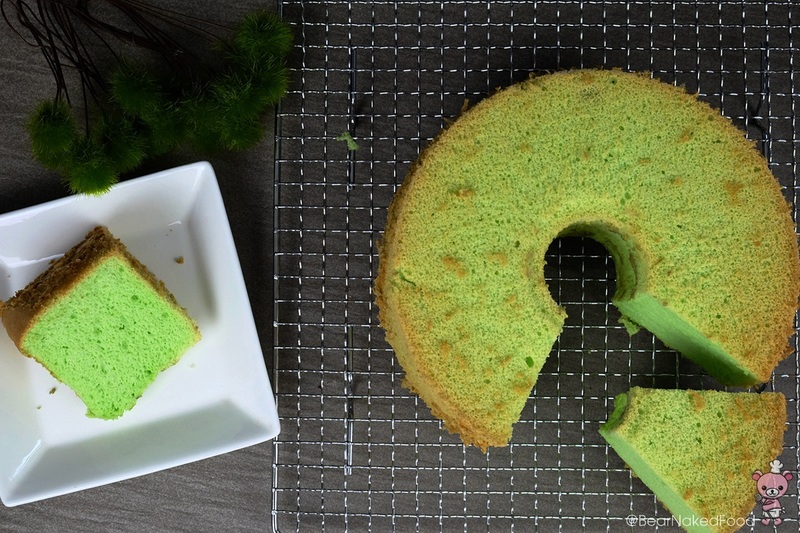 Except for the signature funnel hole missing in the center of the cake, the texture and taste is absolutely perfect. The line up for Part I batter. The line up for Part II meringue. 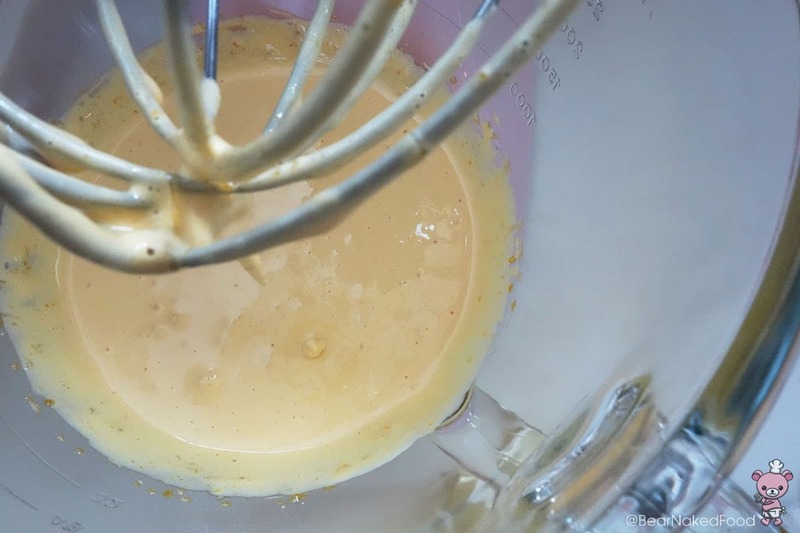 In a large bowl, add in egg yolks and caster sugar and whisk at high speed for 5 mins, until pale and fluffy. 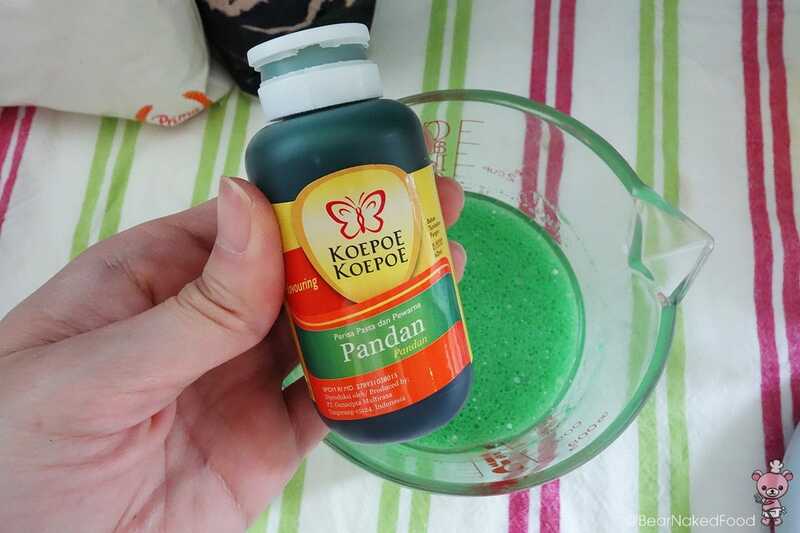 In a medium bowl, mix the oil, coconut milk, vanilla extract and pandan essence together. 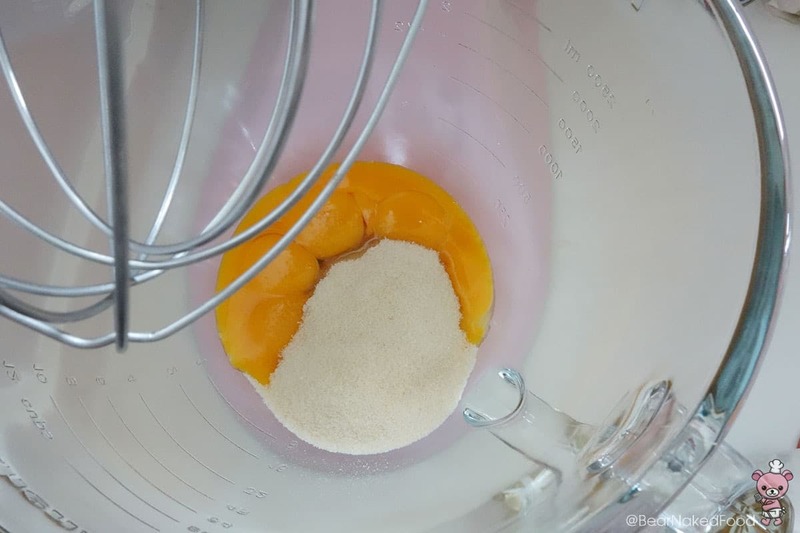 Pour the mixture into the whipped egg yolks and continue to whisk for another 30 secs until combined. 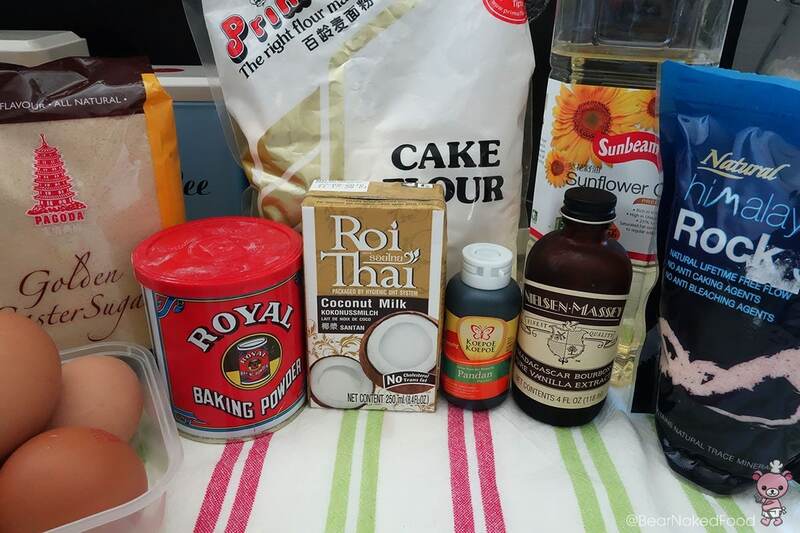 Do not overmix. 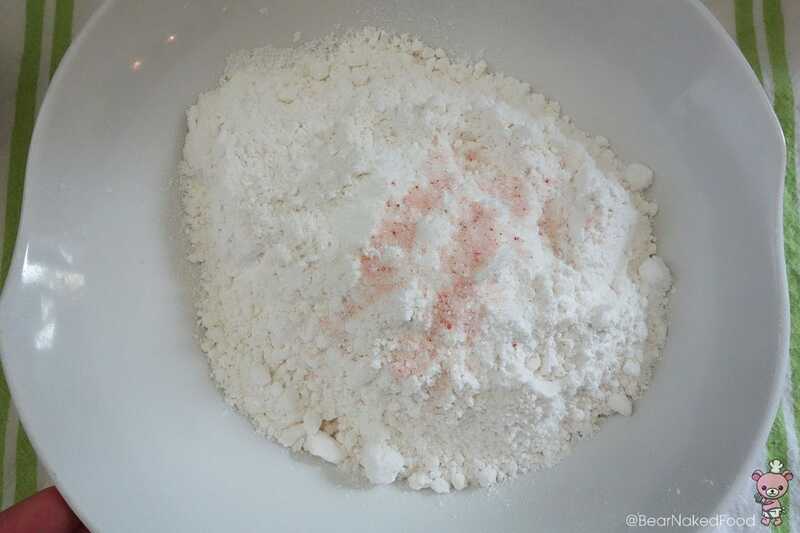 Lastly, add in sifted cake flour, baking powder and salt. 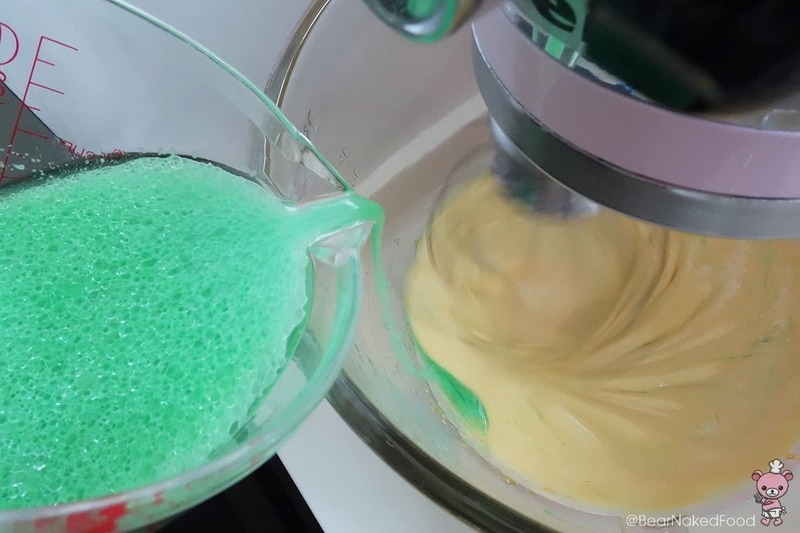 Give it a final mix for 1 min. 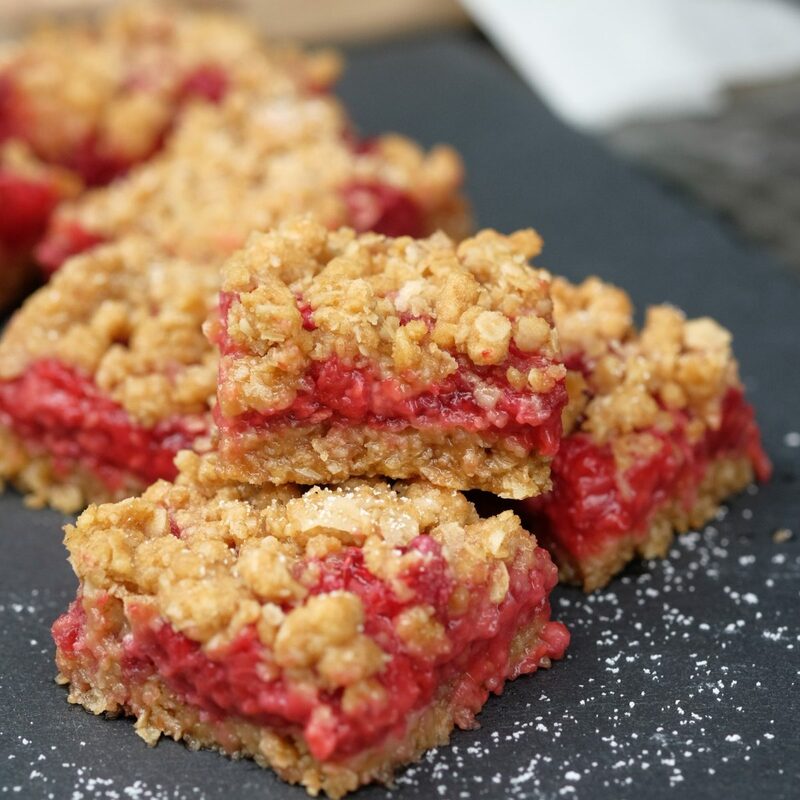 Scrap down the sides when necessary. 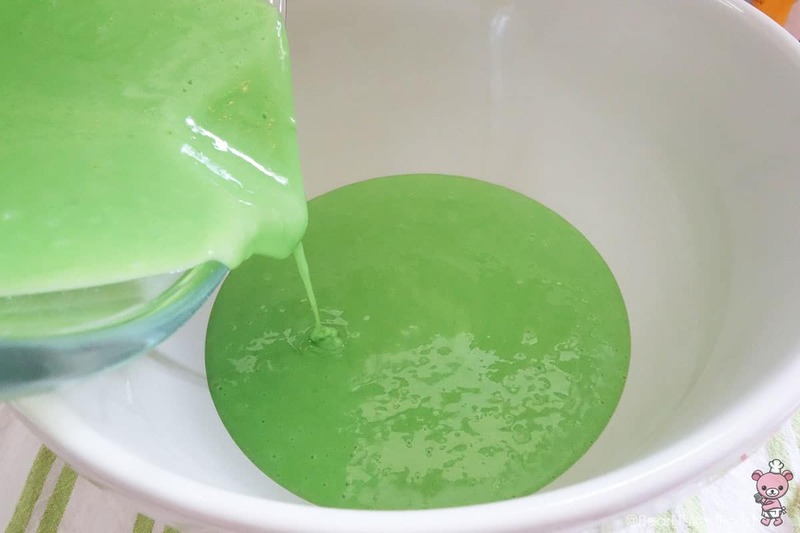 Transfer all the pandan egg batter into a large bowl and set aside. 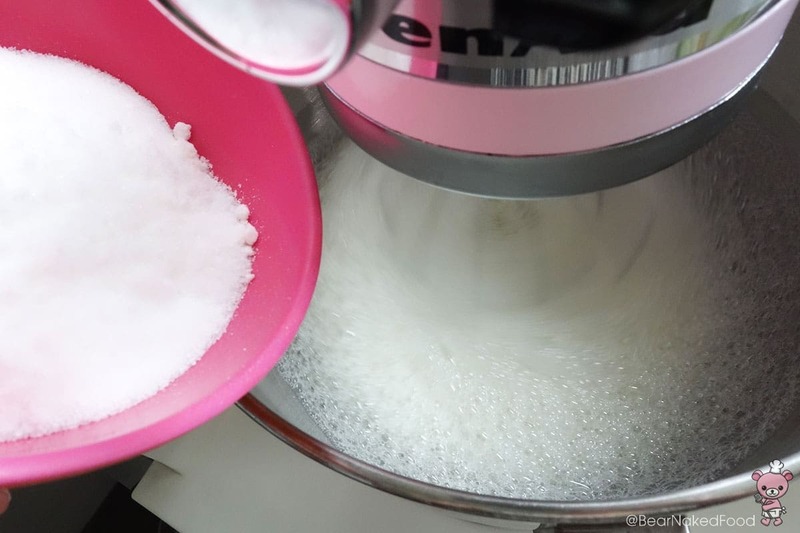 In a large bowl, add in egg whites and whisk at medium speed until foamy, approx. 1 min. 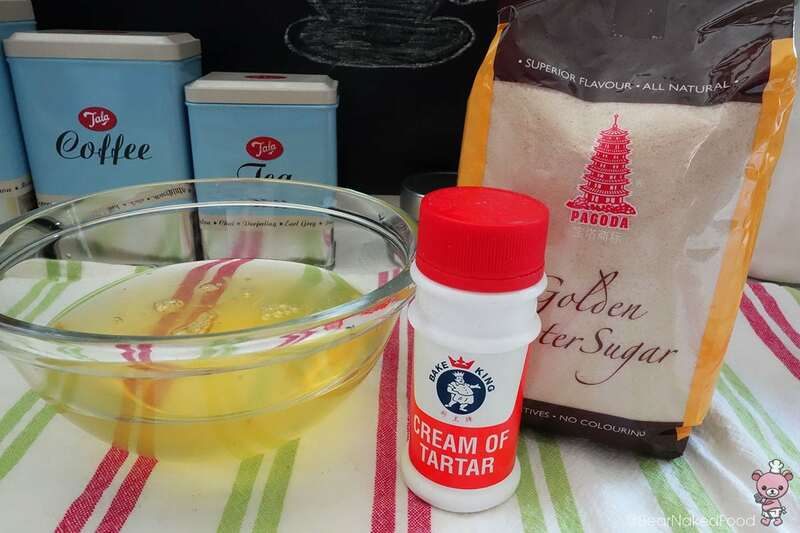 Add in cream of tartar and continue to whisk for 30 secs. 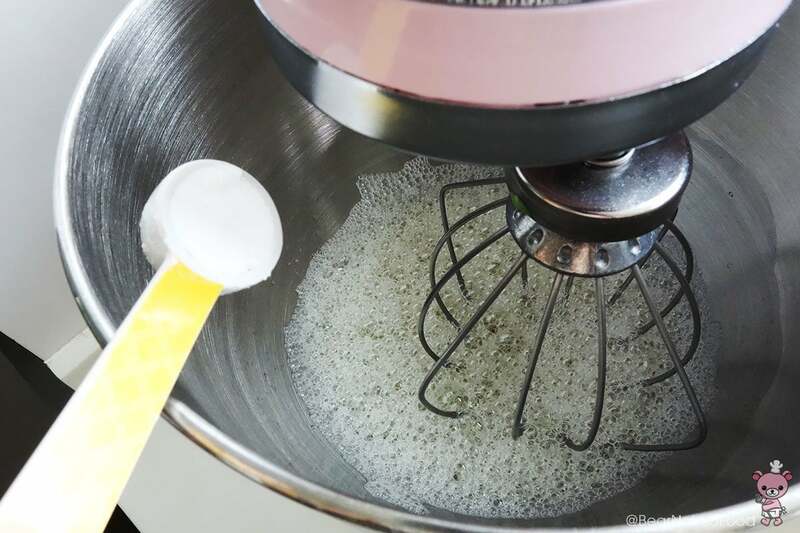 Turn the whisking speed to low and slowly add in caster sugar to the meringue. 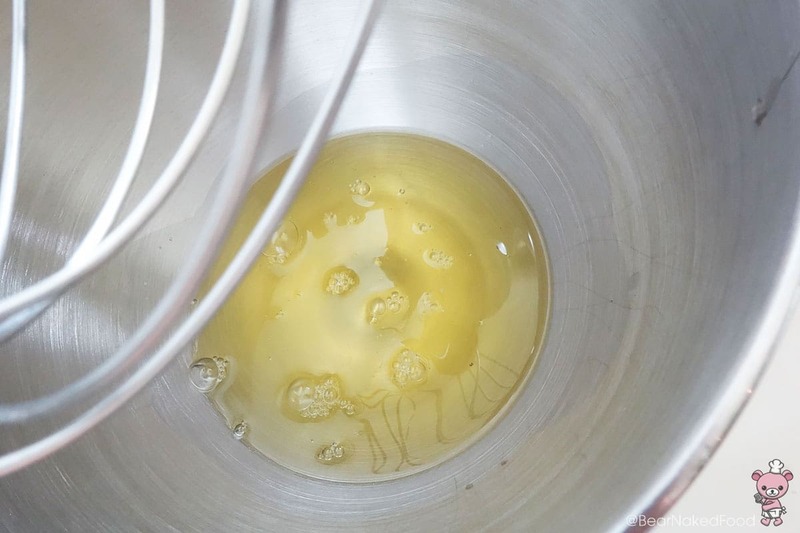 Turn up the speed to high and whisk for another 3 mins, until it just reaches stiff peak. 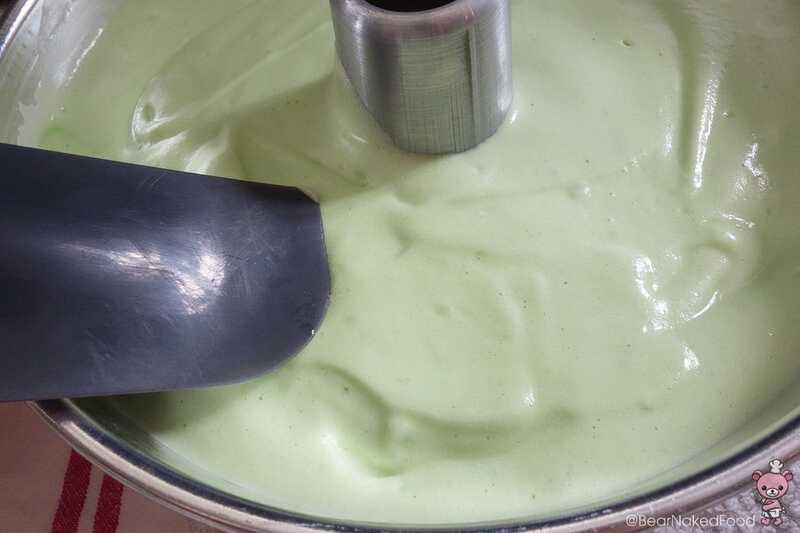 DO not go overboard or your batter will be lumpy. 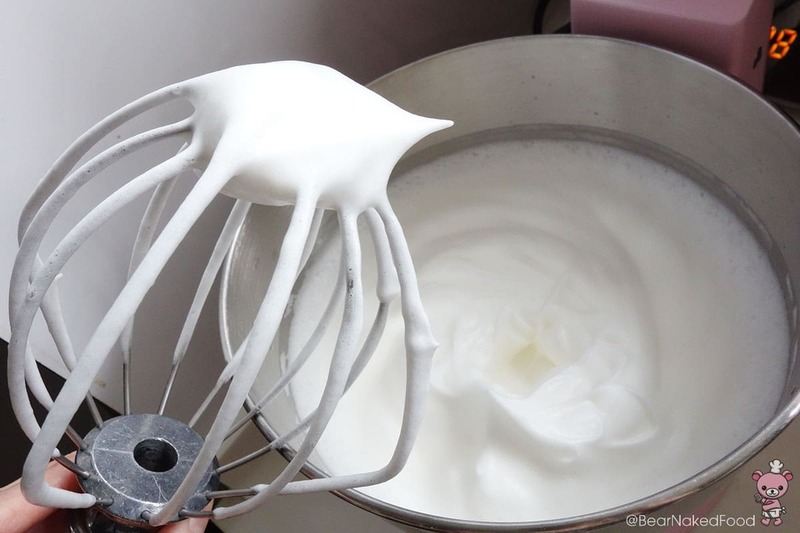 The meringue should hold its shape and not droop. 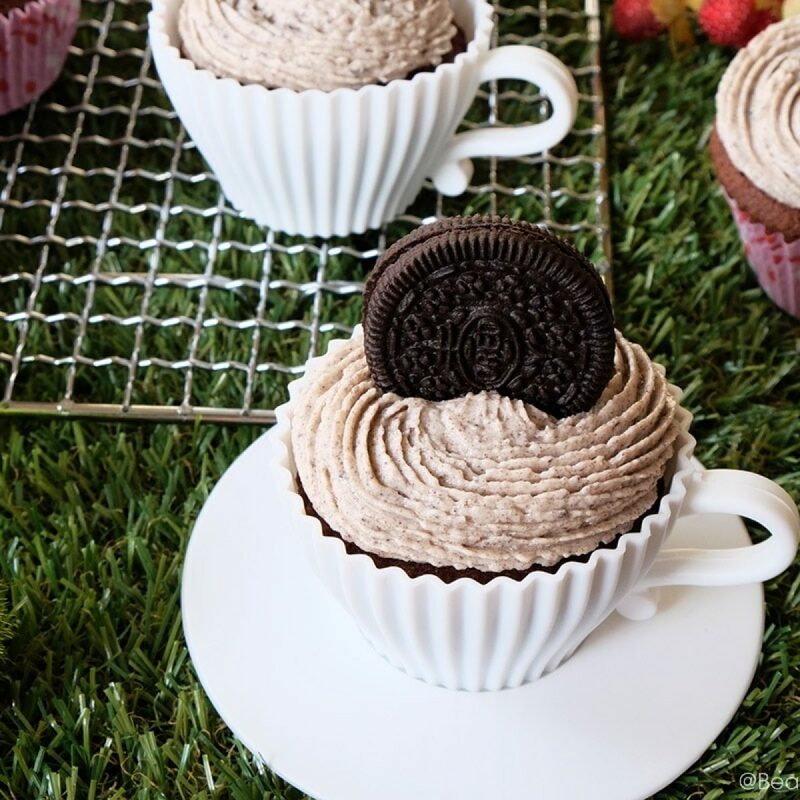 Alternatively, turn the bowl upside down and the meringue should stay in place. 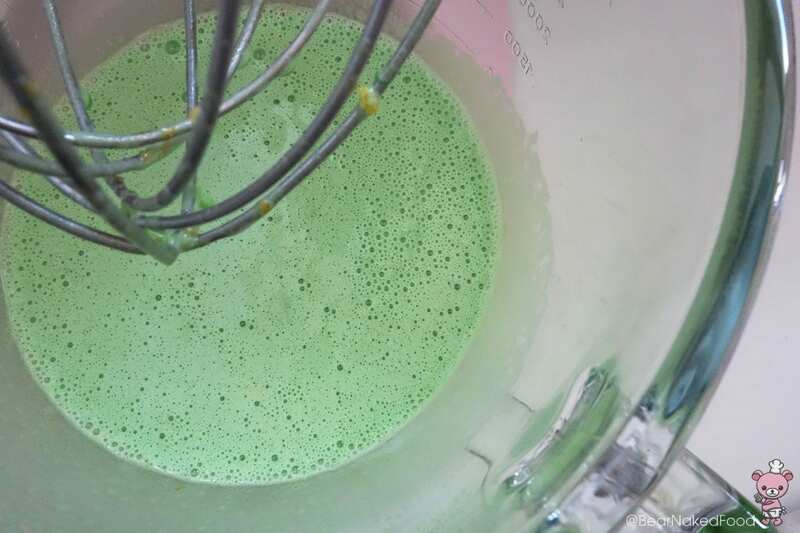 Take 1/3 of the meringue and mix into Part I batter using a rubber spatula to lighten the batter. 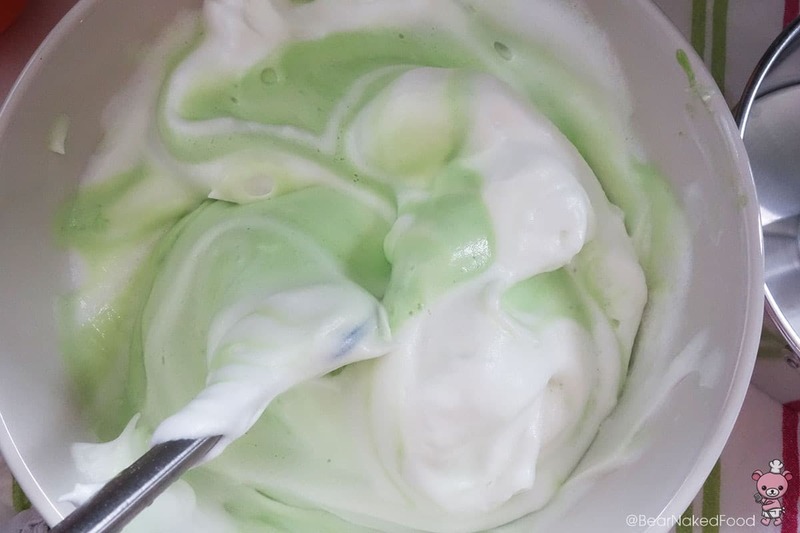 Stir the meringue into the batter to lighten it first. 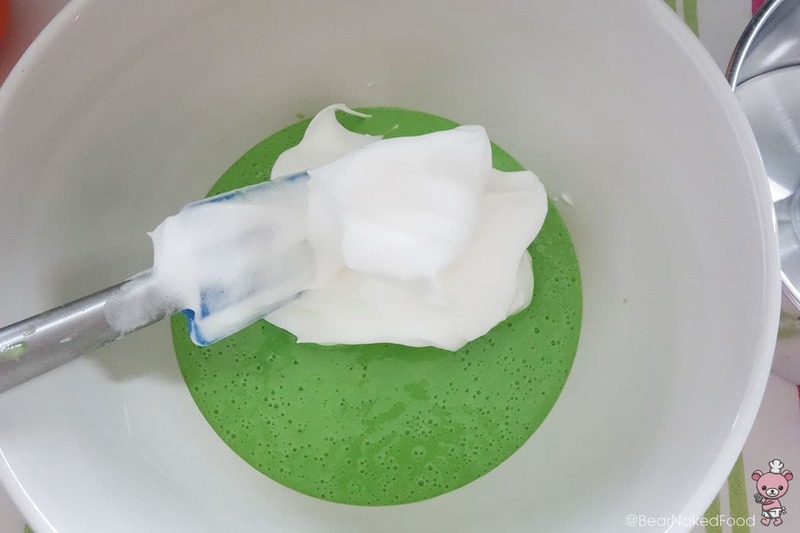 Add in the rest of the meringue and gently fold until just combined. 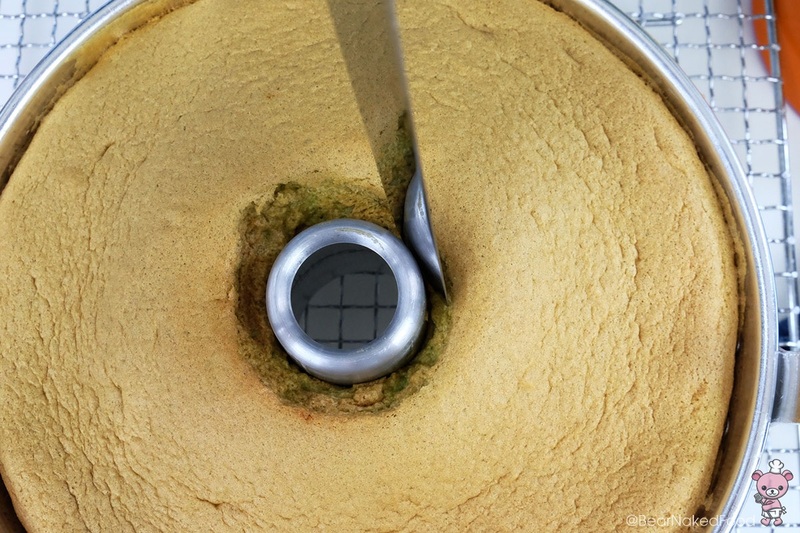 Give the bowl a few hard taps to get rid of air bubbles trapped in the batter. 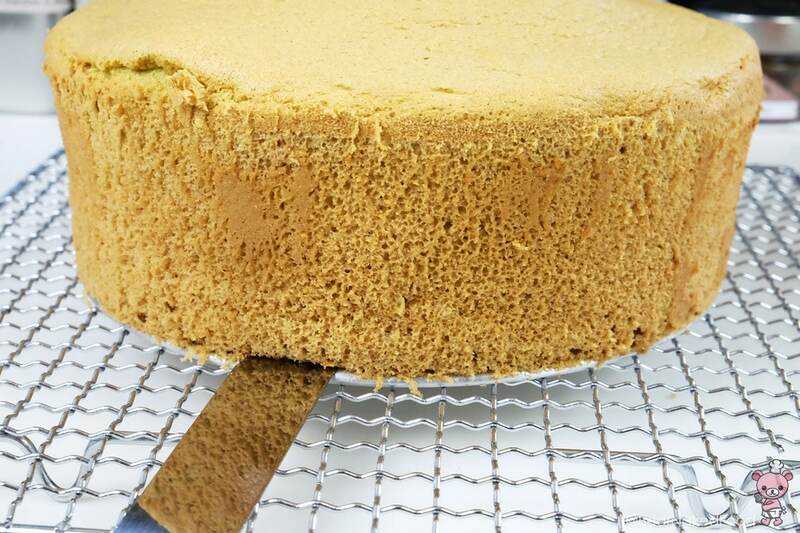 Slowly pour all the batter (do not attempt to turn the chiffon pan while pouring) into a 25 cm chiffon pan. 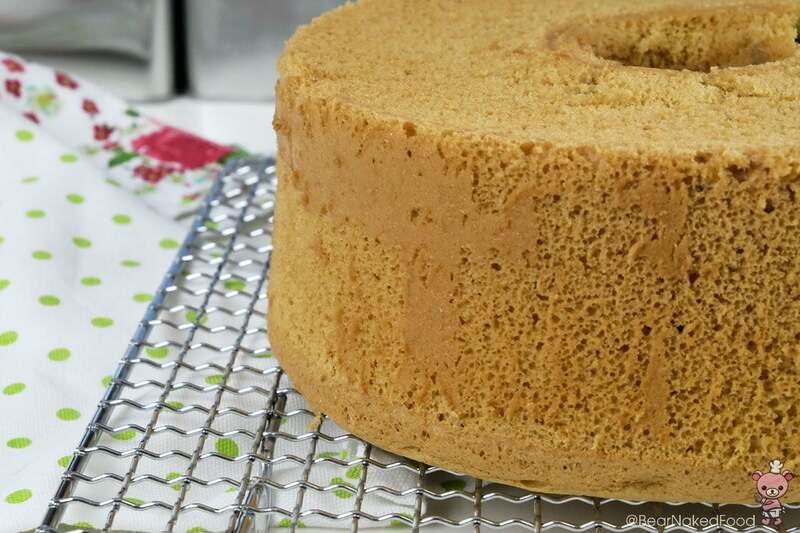 Use a chopstick / skewer to swirl around the batter to get rid of anymore bubbles inside the batter. 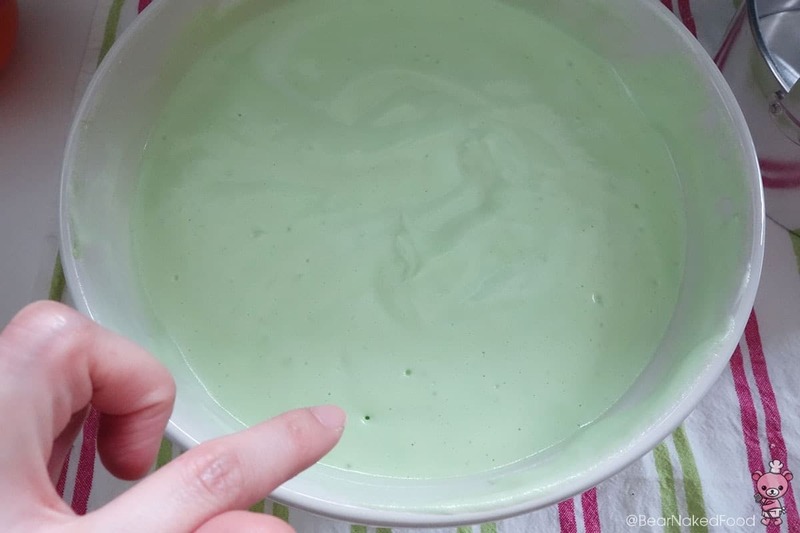 Swirl it around the batter to release more air bubbles. 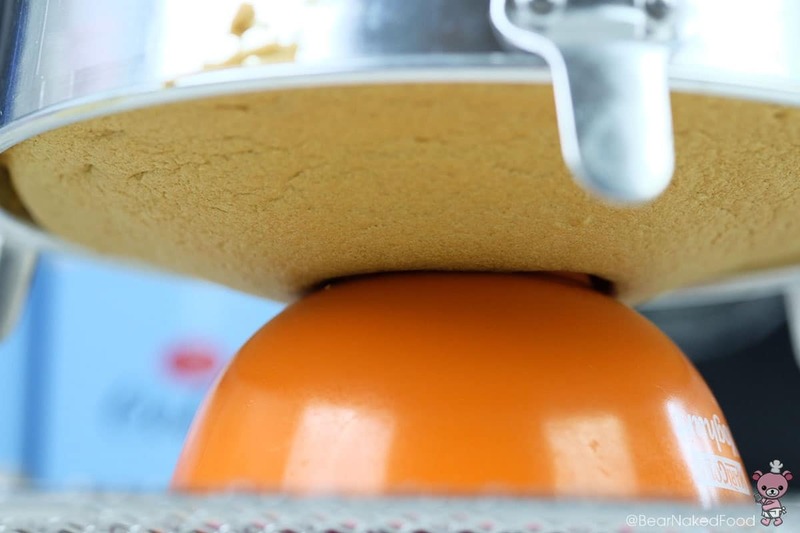 Level the top off with a knife a spatula so you will have a smooth top. 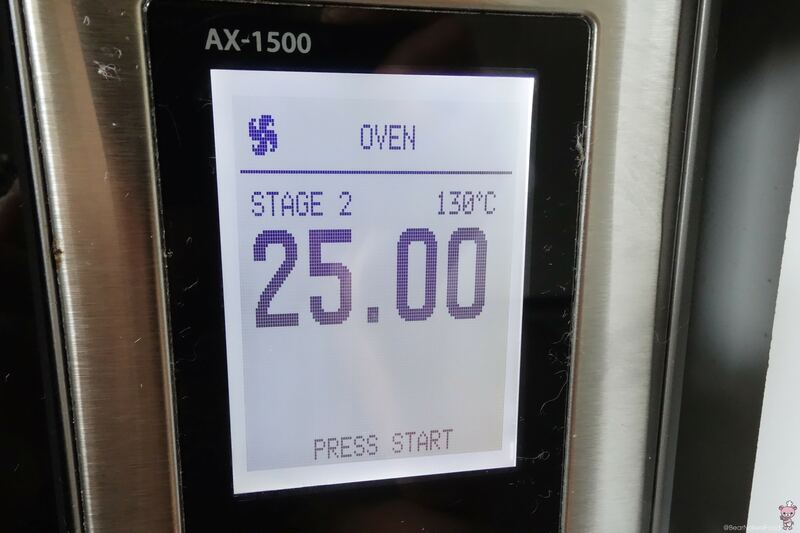 Bake in a preheated oven at 170°C for 20 mins and lower the temperature to 130°C and bake for another 25 mins. 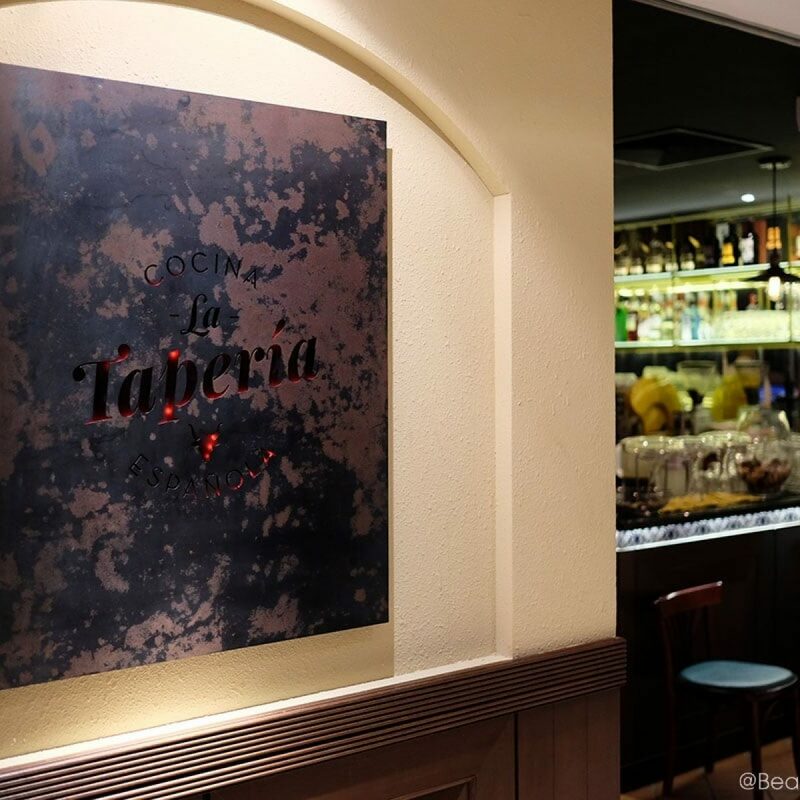 See you in 45 mins! 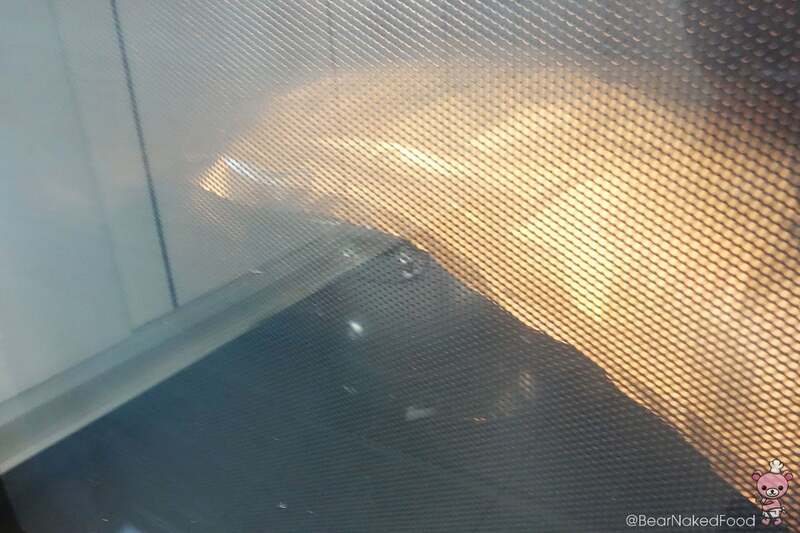 Loosely cover the top with a piece of tin foil if the top is browning too much. 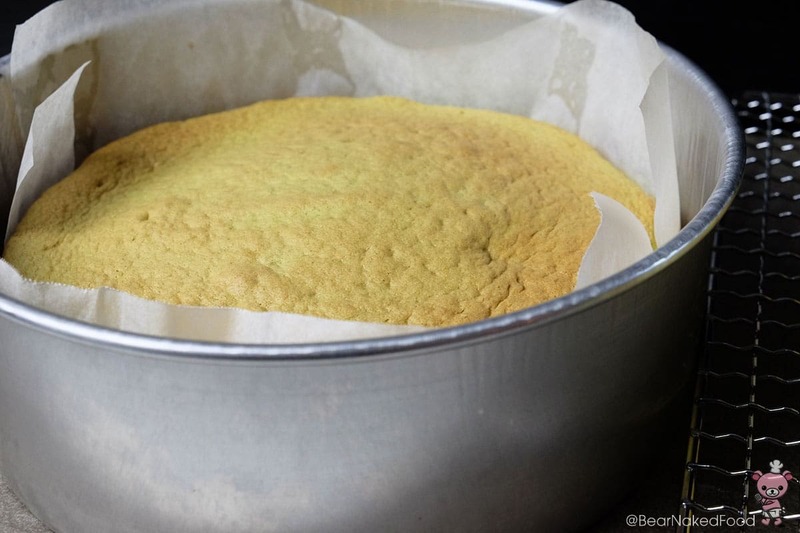 Remove from oven and immediately set the cake tin upside down on top of a bowl or glass to elevate it. 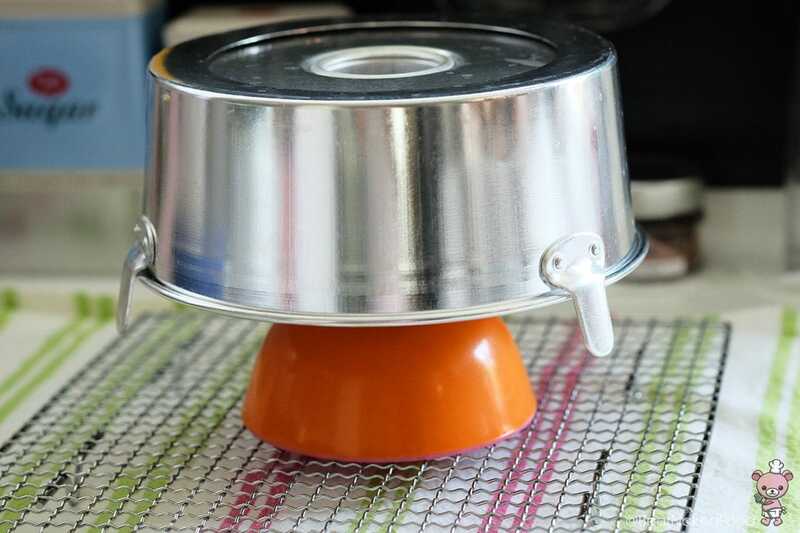 Make sure the base is not too near the counter surface. 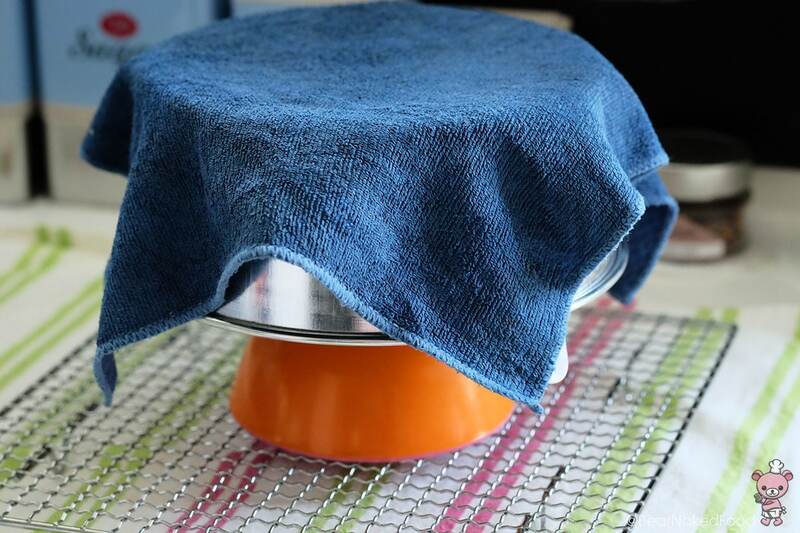 Optional: Cover with a damp cloth to aid the cooling process. 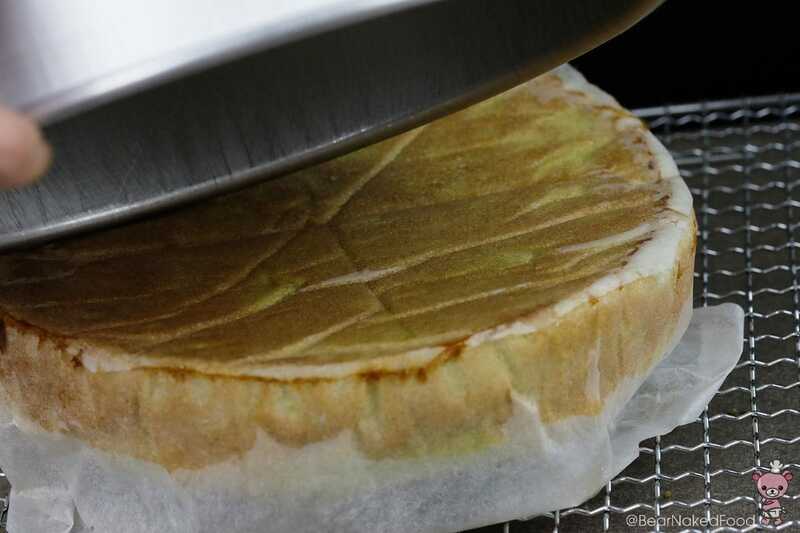 The edges will pull away slightly when cooled. 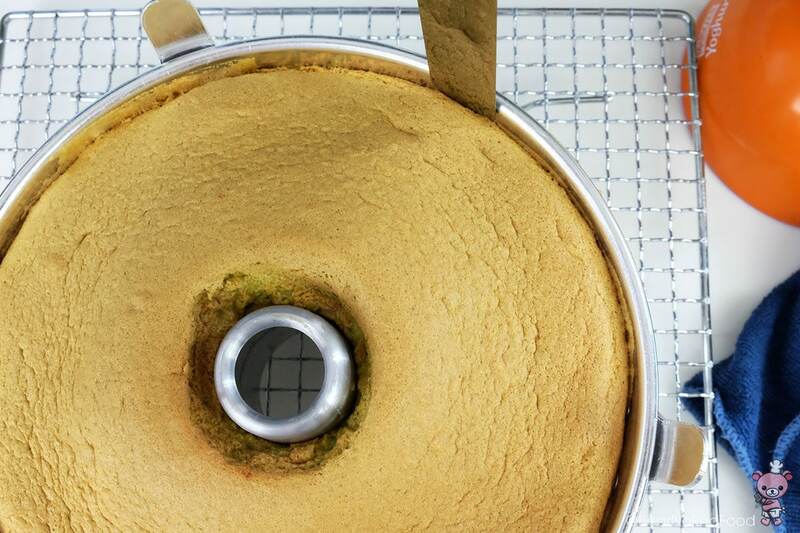 Using a thin sharp knife, insert carefully into one side of the cake and in one swift motion, go around the cake tin and the center funnel. 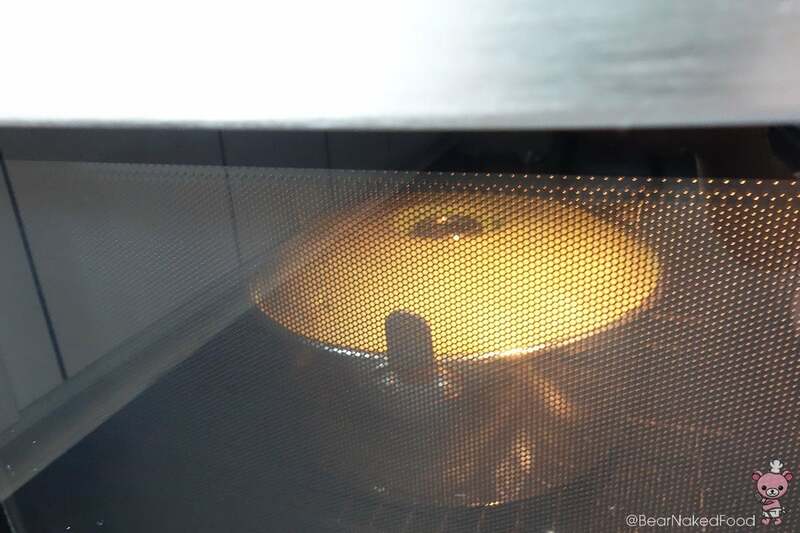 Gently remove the tin. 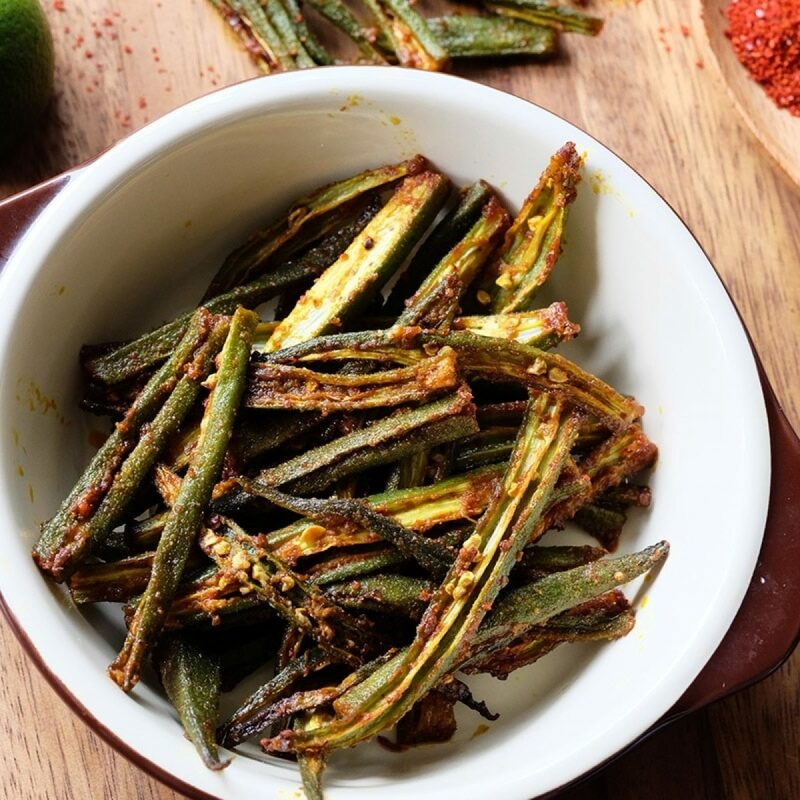 Slide your hand through the ring of the tin. 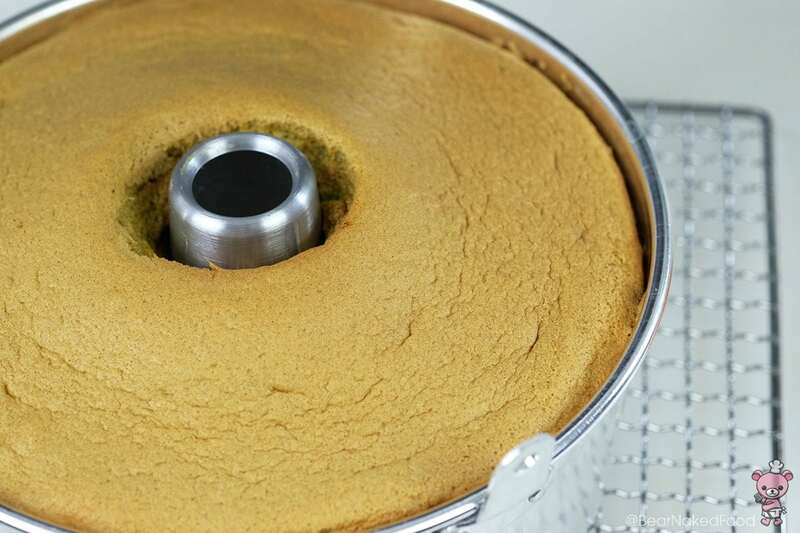 Next, use the same technique to remove the base of the tin from the cake. 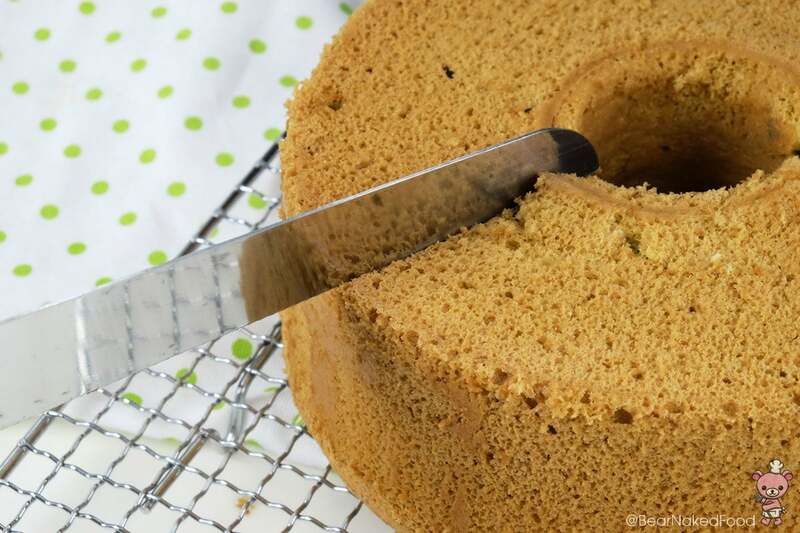 Using a serrated knife, slice the cake and enjoy. 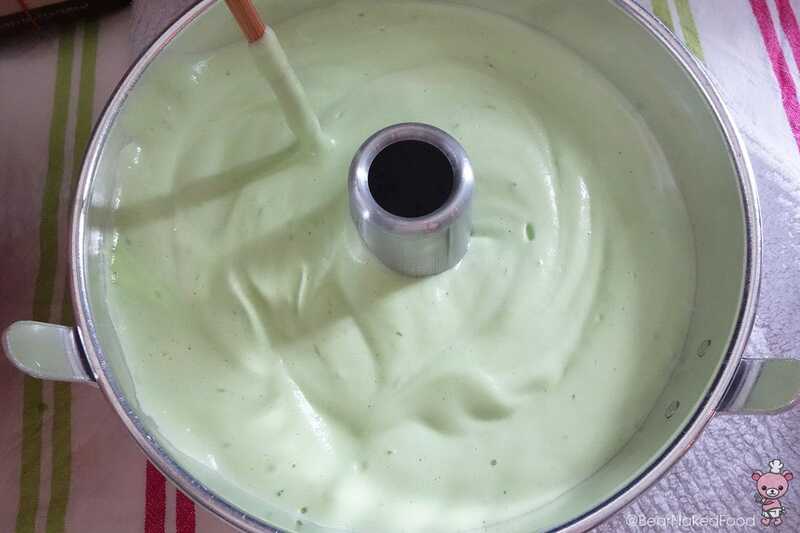 This was the remaining batch of batter, which I baked in a 20 cm round tin. 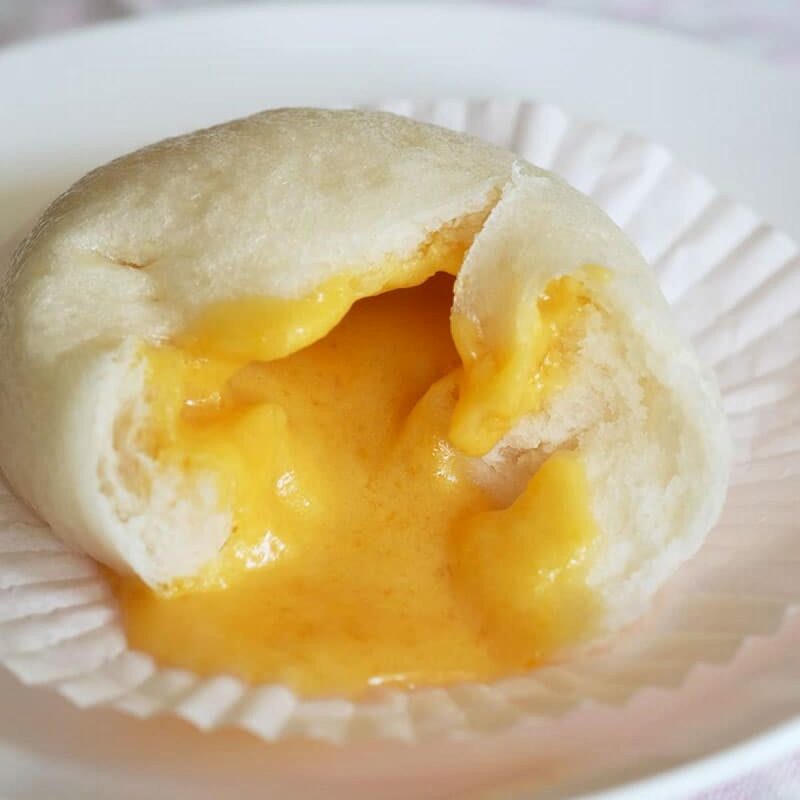 Didn’t rise as much as the one in the chiffon tin but still taste good! 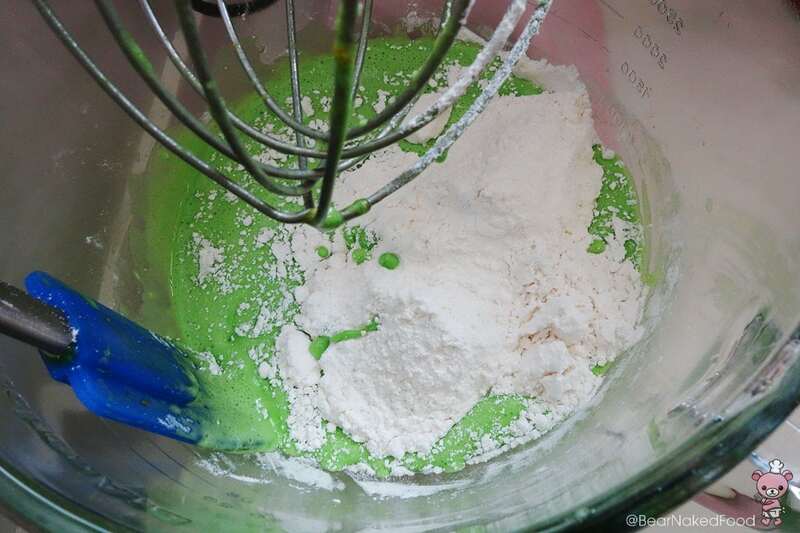 Take ⅓ of the meringue and mix into Part I batter using a rubber spatula to lighten the batter. 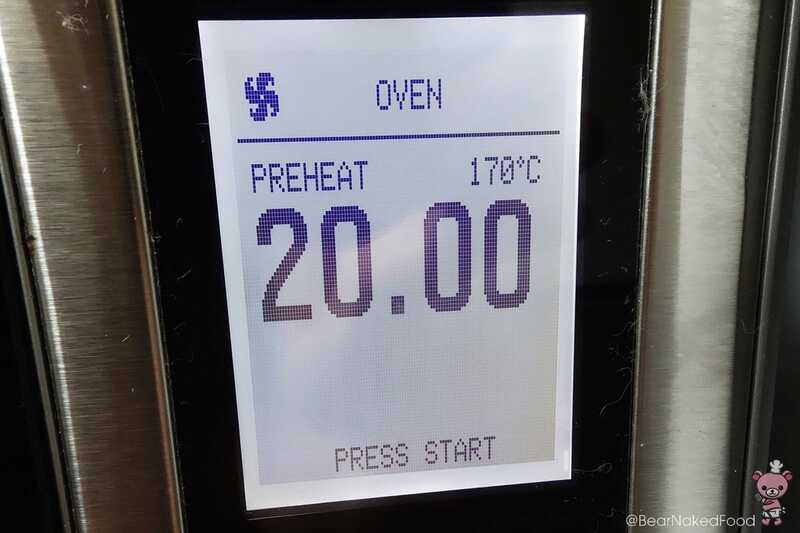 Bake in a preheated at 170°C for 20 mins and lower the temperature to 130°C and bake for another 25 mins. 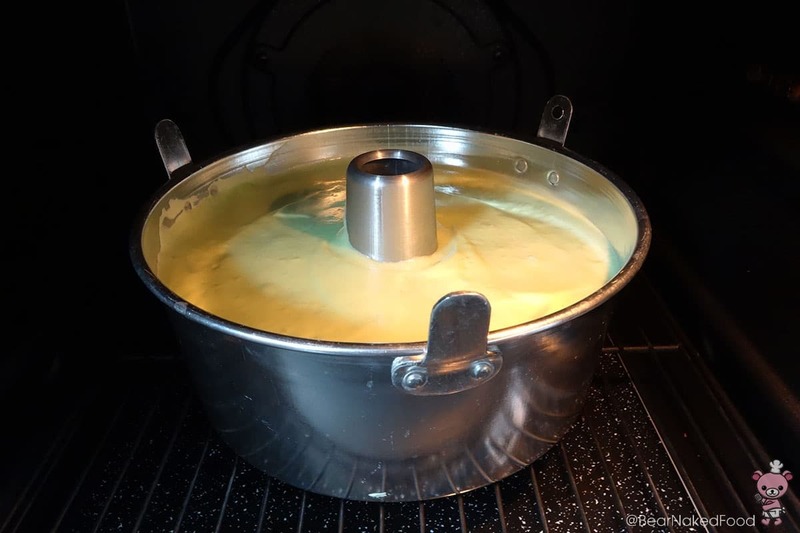 Using a thin sharp knife, insert carefully into one side of the cake and in one swift motion, go around the cake tin and the center funnel. 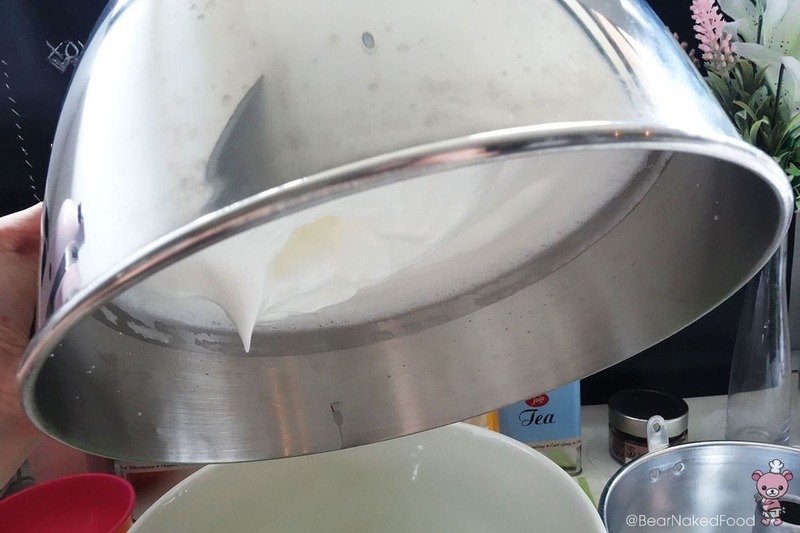 Gently remove the tin. 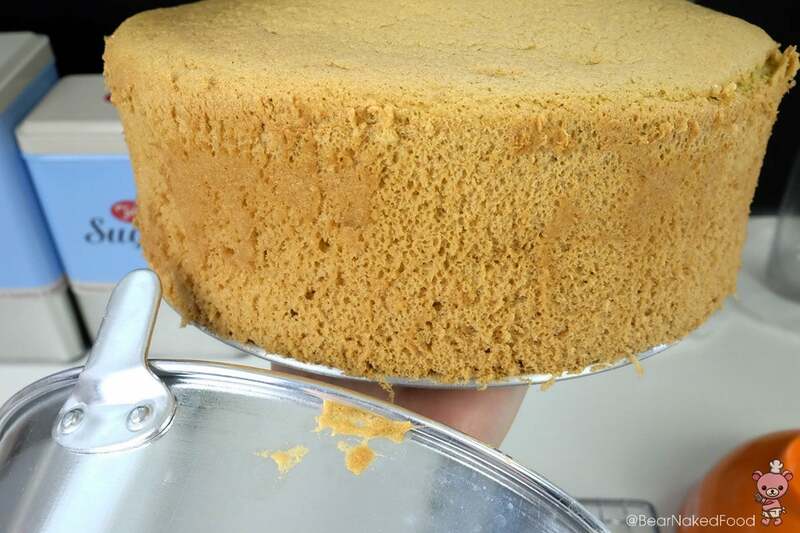 Next, use the same technique to remove the base of the tin from the cake.